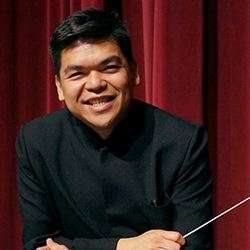 Danh Pham is Conductor of the WSU Symphony Orchestra, and Director of Bands at Washington State University. In addition to directing the WSU Symphony Orchestra and Symphonic Wind Ensemble, he conducts the WSU Opera and Musical Theatre, and teaches Instrumental Conducting and Symphonic Literature courses. Dr. Pham has appeared as a guest conductor and clinician for several international ensembles. He most recently served as conductor-in-residence at the Wuhan Conservatory of Music and Huazhong University in Central China where he taught masterclasses and conducted the Symphony Orchestra and Wind Symphony in concert. He has also appeared with the Guang Xi Symphony Orchestra (Nanning, China) in the Gala Opening Concert for the China-ASEAN (Association of Southeast Asian Nations) New Music Week. Other international organizations include the National Ballet and Opera Orchestra in Hanoi, Vietnam, the Saigon Wind Ensemble, as part of a subscription series for the Saigon Philharmonic Orchestra that was hosted at the Ho Chi Minh Conservatory of Music, and the National Academy of Music in Northern Vietnam. At home, he has conducted professional and honor groups throughout the Pacific Northwest, American Southwest, Texas, and Hawaii. He has conducted the Palouse Chamber Players, the Pan-Pacific Ensemble, and the Palouse Brass Ensemble. In 2018, he makes his debut with the Coeur D’Alene Symphony Orchestra (USA) and the Hubei Symphony Orchestra (Central China). His own groups have appeared at the Western International Band Clinic, the MENC Biennial Northwest Conference, the Oregon Music Educators Association State Conference, and the National Association of Teachers of Singing (NATS) Southwest Convention. Dr. Pham serves on the Collegiate Advisory Board for the Western International Band Clinic, where he has conducted their Intercollegiate Honor Band on three occasions. Dr. Pham serves as a contributing Research Associate for the Teaching Music Through Performance in Band series released by GIA Publications, and has presented at the Washington Music Educators State Conference. He has also served as Producer and Editor for solo compact disc recordings that have been released by Albany and Emeritus Records. Originally from Honolulu, Hawaii, he received his degrees from DePauw University, Indiana University, and the University of Oklahoma. His conducting mentors include Ray Cramer, Stephen Pratt, and William Wakefield. Prior to his appointment at Washington State University, Dr. Pham held similar posts at McMurry University, Western Oregon University, Salem-Keizer Public Schools, and the Beaverton (OR) School District.